Charming 3 Bed House Near Hampton Court! 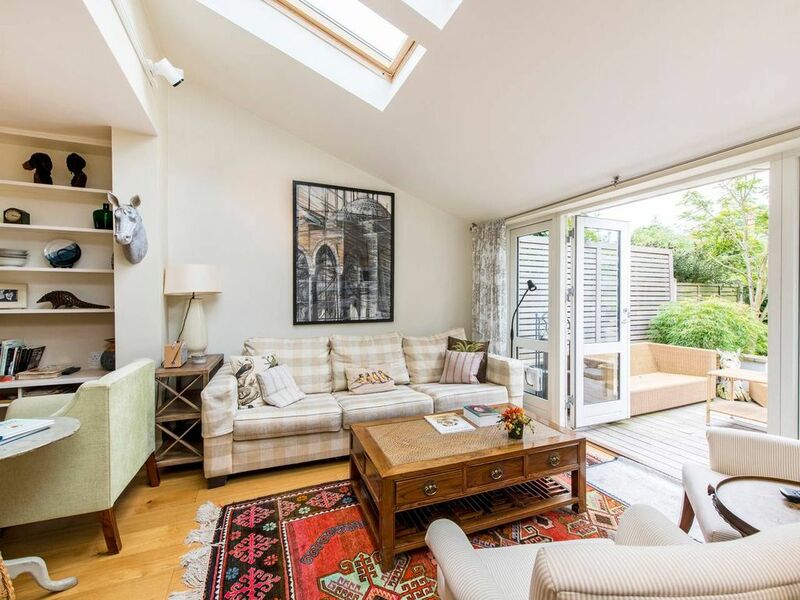 This fabulous 3 bed house is bright and comfortable, perfect for your trip to London. With 3 spacious bedrooms there is plenty of space to relax, and a sprawling garden in which you can enjoy the summer sun. Cook up a storm in the fully equipped kitchen, or relax in the sitting room after a day exploring. Visit Richmond Park with its famous herd of deer, or the historic Hampton Court, just down the river! This beautifully decorated space is perfectly equipped for your stay. With a comfortable sitting room and fully equipped kitchen, you have everything you need. The bedrooms are all comfortable and spacious, and the garden is a fantastic size, perfect for summer sun. The owner’s cleaner comes every Thursday morning at 9:45 to do general household tasks (collect mail etc). Guests will have access to the entire house, except for a few cupboards which will be closed. I am available by phone, email, text, and in person if needed. Teddington is the point at which the Thames ceases to be tidal with the downstream river controlled by the Port of London Authority and the upstream river the responsibility of the Environment Agency. At Teddington only pedestrians and cyclist can cross the river making this a peaceful place to contemplate the locks and weirs that characterise this stretch of the Thames. Teddington’s other big attraction is Bushy Park, the second largest of London’s royal parks. Famous for its herds of red and fallow deer this historic park has a chestnut avenue designed by Sir Christopher Wren, a 17th century fountain topped with a golden statue of Diana and a baroque water garden that had virtually disappeared until it was restored following the discovery, by Sir Roy Strong, of an 18th century painting depicting the garden’s cascades, pools and basins. Teddington Station is a short walk away from the house. From there, you catch an easy train to Waterloo - the heart of London! Please note that we provide shampoo, shower gel, soap and loo roll for the beginning of your stay and not for the entire duration. Please keep in mind that each home is unique – as you are staying at someone else’s home and not a hotel, the space and amenities will be different at each place. Please treat the home with the respect that you would treat your own, we dedicate a lot of time and care to it, so please respect the rules, the space and the neighbours. We would really appreciate if you tell us about any damage or breakages so that we can deal with these issues as soon as they arise. Please note that if your stay is longer than 2 weeks we will require a mid-stay clean at an additional cost of £18 per hour, minimum two hours (to be charged after the booking is confirmed). A linen change can also be arranged at an extra cost. If you require more cleans please let us know as this can also be arranged. Please note that check-in from 1pm - 6pm is only possible if there are no guests staying the previous night - otherwise check-in will be from 3-6pm. Please get in touch if you require an earlier check-in in advance. Please note the property will be prepared by our professional cleaners, using hired hotel-quality linen to prepare the beds. This also includes clean towels, bath mat and a kitchen cloth. Please note that check-in is between 1pm and 6pm. A self-check-in outside of these times can be agreed on occasion, but please check prior to booking if you will be checking in outside check in hours. A late check-out is sometimes possible for a fee of 50% of the nightly rate.